A heroes' journey was set in motion when, in 1904, the millionaire grocery store baron Sir Thomas Lipton was awarded a high honour, Knight of the Grand Order by the government of Italy, a country where he had business interests. When Sir Thomas offered to reciprocate for this great honour, the Italian ambassador asked him to organise a major international sporting event in Italy. 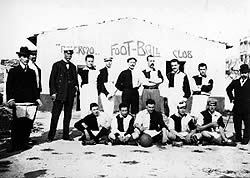 The English Football Association declined to nominate a team so Sir Thomas offered the team from the small colliery village of West Auckland the chance to be the English representatives, even though they were struggling at the bottom of their own Northern Amateur league. The team consisted mainly of coal miners who had little more experience of the outside world than the occasional away game and scarcely any money to fund their ambitions. But they begged and borrowed to raise the fare to Turin. The city was the centre of the Italian cinema industry and there the tournament would be recorded for posterity. During their time away the team had no income from their jobs in the pits. But great sacrifices were made with personal belongings sold and family hardship endured by those left behind. After an arduous channel crossing and lengthy rail journey, the team was warmly greeted on its arrival in Turin by a committee and a brass band. Among the crowd and civic dignitaries was a banner proclaiming 'Welcome Woolwich Arsenal'. They had mistakenly assumed that the WAFC was Woolwich Arsenal Football Club. Nobody had heard of the little known West Auckland amateur team, even in its own country, let alone in Italy. Astonishingly West Auckland went on to win that year. An even bigger shock was in store two years later when defending their earlier triumph West Auckland defeated the mighty Italian team of Juventus 6-1. West Auckland had etched its name in the annals of soccer history as the winners of the first World Cup as surely as their name was etched on the cup. Under the tournament rule, the magnificent trophy was now theirs to keep. But celebrations were soured by the team's debts, which forced them to pawn the trophy to the landlady of the local hotel, the club headquarters, on their return. It remained with her family until in 1960 a village appeal raised the funds to redeem the pledge and the cup was returned to its rightful owners. 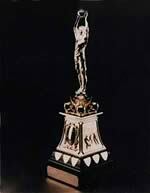 The cup was subsequently stolen in 1994 and theories about the thief abound. Despite the efforts of the police and a £2,000 reward it was never found. But an exact replica now stands proudly in a more secure cabinet in the West Auckland Working Men's Club. Packed with anecdote and incident this is a David and Goliath story about the ambition of a group of men who had the imagination and determination to escape their grim reality.